Initially the title I have used was just a “working title”. I was going to paste in the title used in the material that promoted the lecture. But take one look at “Progress Lost, Progress Redefined, Progress Regained – How Location Efficiency Performance Measures Are Being Used to Achieve Economic Security” and I think you will agree that it is hardly a grabber. This was the second of two talks by Scott Bernstein, President, Center for Neighborhood Technology, and the Visiting Fellow in Urban Sustainable Development in SFU’s Urban Studies Program. The most noticeable thing at the start was the nearly empty room. I got there fifteen minutes early so I could sit near an electrical outlet, but I need not have worried. There was a very late start, and a very long introduction: this included the information that “The Visiting Fellowship in Urban Sustainable Development is funded from an endowment by the Real Estate Foundation of British Columbia and the Fraser Valley Real Estate Board.” Which makes me wonder why the room wasn’t populated by the development community. Michael Geller was there and sent a few tweets: there will be a video of the talks at the Urban Studies web page, in due course. A new index of combined affordability of housing + transportation, which cost households at least half of their available income, are being tested by federal agencies, metropolitan organizations, states and local governments. The results are encouraging. 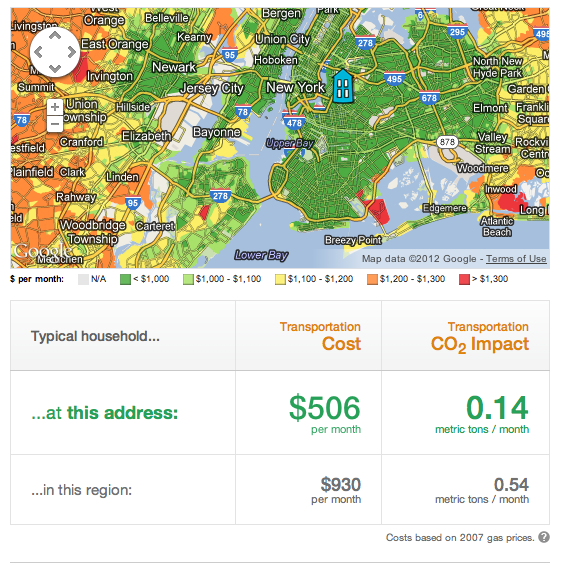 Agencies taking combined affordability into account have shifted billions of dollars in long-term commitments from highways to transit; provided incentives for locational preference in subsidized housing; and awarded capital intended to demonstrate the efficacy of place-based integrated resource strategies. Location-efficient neighborhood residents felt only one-quarter the economic “pain” felt due to gas prices by those in average neighborhoods, while those in the least-efficient places experienced their region’s highest foreclosure & bankruptcy rates. Bernstein started by saying that he intended to take a “fresh look at the benefits of transportation and better cities” and why it’s worth paying attention to the efficiency of location. One of the advantages of confining the study to the US is the relatively open source data available everywhere. This is in stark contrast to Canada, of course, where StatsCan has been trying to make data sales a major source of revenue and has only recently begun to relent from that disastrous decision. Even so our Prime Minister, who clearly dislikes the way that facts and figures get int he way of his prejudices, cancelled the long form census which deprives us of about the only data on commuting behaviour across the country. What is different is that he focuses on what to expect from our public investment, its benefits, not just the costs. He mentioned how gobsmacked Stephen Quinn of the CBC was at this notion, when he appeared on the Early Edition recently. All the prepared questions were simply about the amounts of money that would be spent – not the returns that would generate. This illustrates the ignorance of why infrastructure is important to cities. It “provides the stuff you need to make the buildings work” and includes municipal services. He estimated that in residential developments this amounts to US$50-100k per unit plus the land cost – which is roughly similar. Basically what he is advocating is how to get the infrastructure shared by more units, so that the cost gets lowered. Over the last 30 years we have seen better solutions emerge. For instance, we no longer see rain as a dangerous waste product once it hits the ground. The development of green infrastructure has produced a new mind set. Previously the purpose of investment was to promote consumption: now it can be to increase productivity – e.g. streets to connect people rather than promote car use. It has even proved more efficient to pay people to consume less energy than build new power plants. Findings from recent polls show that people want better, more affordable transportation but are not wiling to raise gas tax to pay for it. They do not trust the system to deliver the promised benefits. 13 states allow voter initiatives “tax elections” which show that people will vote for increased taxes provided that there are specific conditions in place to ensure delivery, and the ability for voters to sanction those that do not deliver. These programs are always local or regional in nature and not led by a state or federal government. There have been some very significant demographic and price trends. Since the beginning of the twentieth century household size has been steadily declining. At the same time developers have increased home sizes. They have found that they cannot sell that product any more. Gasoline prices were $1.13 a gallon in 2002 and $4.33 now – with the clear expectation that they will rise further. People who live in new exurban developments, where there are no services find that they have to spend a gallon of gas to buy a gallon of milk. 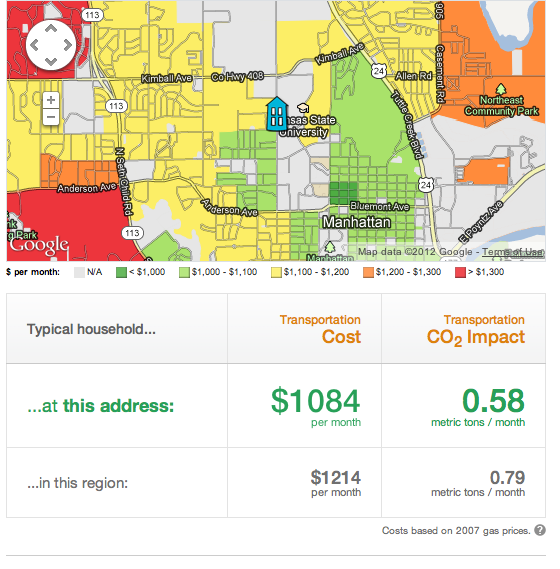 The increase in gas price has been 8x faster than income. There has been ten years of foreclosures in the suburbs – not just since the 2008 market crash. Currently the most attractive investment is high density Transit Oriented Development (TOD). He noted that it is harder than it should be to do TOD here! He showed a graphic which contrasted the “Nourishing economy” where connectedness = prosperity, compared to the conventional model of residential cul de sacs, and limited access highways, which is where economic distress is note widespread. His advice was that we should tear down the viaducts – just as other cities are doing. A good example of what he advocates is the Pearl district in Portland OR where affordable housing is mandated at 25% on all development. It is not concentrated in one place, and there is no displacement due to development. The idea is to build things worth keeping up. He eulogized Ellen Swallow Richards – inventor of the calorie counter, and the standardized home budget. She thought it important to teach people financial literacy and persuaded high schools to have mandatory home economic courses. “Somehow we got through the Depression” – mainly because people understood how to economize. Her structures included “Don’t go into debt for an automobile”. Eventually home ec was squeezed out by drivers ed. This was because federal funding of freeways required that there be a road safety component. The revolution between 1885 and 1902 was the introduction of streetcars – which was equivalent in its day as the internet has been tom our era. There was one system in 1885 and 1 in every city of 10,000 by 1902. He did, in my view, somewhat confuse the issue by talking of streetcars and interurbans as though they were the same thing. He said that the streetcar was an illustration of a network economy. The first telephone was a curiosity: it was not until there was another one that it had any use, and the use grew exponentially as more telephones were added to the system. Location efficiency = you don’t need to drive as much. A combination of density and transit access (proximity, frequency, connectedness) lowers the cost of living. Good transit access equals one car less per household , the equivalent of an increase of 10 to 20% in income tax free, or around $5k to $8k pa. Location Efficient Mortgages way outperformed the market. In 30,000 transactions there was only one default and not one repossession Fanny MAE only committed to one experiment – it did not fail! This is in strong contrast to the “drive until you qualify” approach, traditionally used by lenders. There is in economists language “severe information asymmetry”. A British popular song ended with the tag “a week’s wage for a month’s rent”. This was the extent of the support for the notion that a household can support a mortgage at 30% of salary. In many years of searching he has found no research backing for 30% affordability. And, of course, no reckoning of transportation cost. 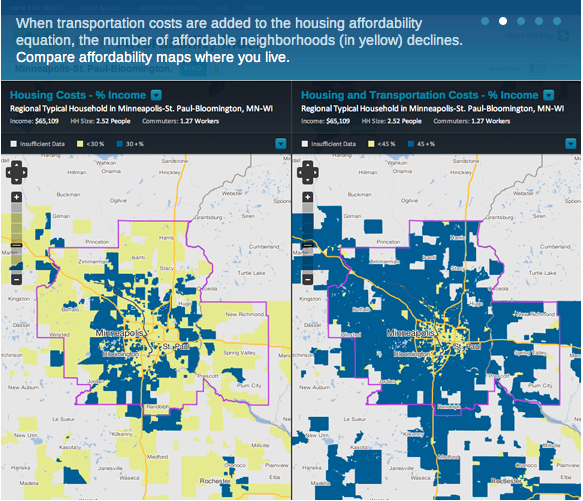 The Housing + Transportation Cost Index has been published in two books – “A Heavy Load” and “Penny Wise, Pound Fuelish” but there are now two new online tools using US data. He also pointed out that other researchers have found very similar results in London and Tokyo. While I am quoting him I feel I must mention that no-one had corrected him talking about “the Frasier valley”! He said that HUD (Housing and Development) and DOT (Department of Transportation) both US federal government departments are using it to screen grant applications, MPOs (Metropolitan Planning Organizations mandated by federal transport funding requirements) are using it to rescreen transportation plans. At this point I feel I need to explain that he was using slides with two columns and five paragraphs in each. There was too much information presented in a very short time and some of it was impossible to absorb. All I can do here is give some highlights that stuck in my mind or I was able to type. El Paso TX is now directing affordable housing to areas of low transportation costs. Washington DC which was looking at one or two streetcar lines has now decide to build 20. He said that there is now a 200% net return on public investment (I assume he was either talking about streetcars or TOD) . Do you want to succeed for the long term? The Q&A was not recorded by me but will be on the SFU video. If you do a search of this blog on the term “Location Efficient Mortgages” you will see that what he is talking about is not exactly news. He has been at this for thirty three and a third years (he said). The questions that come to my mind revolve around why it is taking so long for these ideas to get adopted. In this region, of course, we have gone in completely the reverse direction. The BC Liberal government decided to expand the freeway and to hobble public transport. Christy Clark is simply following in the footsteps of Gordon Campbell – and Ujjal Dosanjh. There is indeed a task force on affordable housing – and a fat headed approach to transit funding, which prevents any real progress towards sustainability in this region. There was a criticism of the Livable Region Strategic Plan in that it did not address affordable housing. That seems to be to miss the point completely. If we had done what the LRSP aimed to do – build a compact urban region, with complete communities that protected the Green Zone and increased transportation choice – then we would not have the crisis we now face. There is some transportation choice in Vancouver and Burnaby – but it rapidly declines away from these municipalities. Everywhere else – and to some extent in those cities too – we have seen workplaces decentralize (something the LRSP did not anticipate) and steadily increasing suburban sprawl. Most of Vancouver south of 12th Avenue is suburban, and all of it unaffordable by any measure. One thing that cropped up more than once in his lecture – usually as unscripted asides – was the potential for our region to see the same real estate crash that has affected the US. We certainly do not have what he termed funky mortgages like theirs. But most people here have very little financial room to manoeuvre and are just as vulnerable to rising gas prices, with often no realistic alternative to driving. Not just for work, but for everything. And the real estate sponsors of this talk are ensuring that we will see low density, single family subdivisions endlessly extending up the valley for the foreseeable future – with Squamish now added for good measure. This is a recipe for financial disaster, and is nothing like a sustainable region. « Affordable housing in Vancouver? Why bother? Where rapid transit lines go, higher density housing follows (higher density doesn’t mean high rises, as Luis Villegas reminded people this week in a meeting about the Rize building at Broadway and Kingsway). Mayor Robertson talk about Vancouver being the greenest city IN THE WORLD by 2020 (talk about the frog trying to be bigger than the bull!) but there are no plans for an extensive rapid transit system, even though there is nothing in over 1/2 of the city, nothing on the North shore, Most of Richmond, Surrey, White Rock etc.) and taking creative measures to reduce the use of cars. Not to mention all sorts of relatively simple green solutions that have been adopted in the USA as well as in Europe and Asia. Yes transit is controlled by the provincial government..made of politicians that have likely never used transit in their life, but surely –and this is commonly done in countries on several continents thus with different cultures— mayors can have lot of clout —-behind closed doors–with a premier or regional president or whatever each country calls the head of that second level of government. “Where rapid transit lines go, higher density housing follows” – not in the City of Vancouver it doesn’t. The only major development on SkyTrain has occurred at Joyce/Collingwood. Everywhere else neighbourhood resistance to increased density prevented anything happening. Mayor Robertson does not speak for any of the cities outside the CoV – most of which have embraced development, and some put in TOD when they could. In the case of Port Moody, ahead of rapid transit, which has still not arrived. Burnaby got lots of rapid transit, but chose to go for office parks and auto oriented retail anyway. Mixed use is mostly unheard of. The Province (Ujjal, NDP) ratted out the GVTA on the vehicle levy (which was in the GVTA Act) in exactly the same way that Christy (BCL) has done now. The Province (Glen Clark, NDP) had a Greenhouse Gas Action Plan in 1995 and stuck it on a shelf, unimplemented. Short term political expediency always trumps long term planning whichever party is in power. Electors still allow themselves to be swayed by people like John Cummins and Mayor Ford. The latter has just demonstrated how little clout his office has. In Greater Vancouver the Mayors have once again been shown to be too ready to believe Ministers when the Premier actually makes the decisions, not the cabinet. In BC it does not matter what the rest of the world does – even if it has been shown to work in all kinds of places. We think we are special and different. “Not invented here” is still a killer argument that underlies much of our ineptitude. Stephen, thank you for taking the time to supply this review. I’ve long felt the link between transportation costs and housing prices was absent from discussions of transit and affordable housing. Now I see a few like Bernstein and you have done the calculations. One problem is that here in the Lower Mainland we are equating “skytrain” with “towers”. If you look at Port Moody, the Skytrain is going to be too far away, and too far up the hill, for tower dwellers to walk to. As Richard has pointed out here, Skytrain requires riders to take a bus to get to the train. When I visit Ioco Road what calls my attention more than the condo towers is the almost complete absence of pedestrians, and the fact that the public realm is designed for driving. Ioco Road is an uncrossable river of asphalt. My real worry is that the nodes that have built out near Skytrain (Metrotown, Brentwood, Edmonds, Lougheed, Port Moody, Coquitlam Centre, Surrey Centre, Richmond, Commercial & Broadway, and Main & Terminal in Vancouver) fail to support social mixing. The tower neighbourhoods outside the downtown peninsula are awful. That does not bode well for Cambie & Marine, or Broadway & Main. I also worry that the bird’s eye views of the Cambie corridor are not going to improve matters. Keep in mind that the “revitalization” of Cambie Village (Cambie between King Ed & 12 Ave.) did not bring about any noticeable improvements for pedestrian use of the street. The number of lanes was kept exactly the same. Thus, the Canada Line only served to create more room for cars by removing trolley service from Cambie street. Transportation is a fundamental player in good urbanism. But, it is only one element. The other parts have to come in as well, and they have to be of a scale and fit that will make the place work for people. The historical narrative is that over-reliance in private transportation (automobiles) has destroyed our neighbourhoods by depriving the arterials of social function, creating conditions dangerous to life, and hazardous to the health of those living in units either fronting, or nearby. Building higher than six storeys, whether within walking distance of transit or not (TOD), is really nothing more than a naked market play. It has joined the best interests of profit-driven private sector, with the ability to collect land-lift taxes by cash-strapped local government. The future viability of our neighbourhoods hangs in the balance.